The Mapua Libraries assesses its services through regular surveys as well as user needs studies and usability studies to ensure that our physical and virtual services meet the needs of the Mapua community. This report describes our processes and presents some of the results. The MIT Libraries are currently compiling the results of the 2015 survey. Results will be available by late 4Q. The Office of the Chief Knowledge Officer and the Department of IT modified the library home page and has revamped the collections site, based on user feedback and usability testing. See the results! Mapua Libraries Assessment and User Experience and Web Services team is currently conducting various projects in the following categories in order to improve library services and user experience of Mapua Libraries. The Libraries have conducted three surveys: in 2013, 2014, and 2015. Information and results can be found on this page. The Libraries will be conducting usability tests of the web site and various research-related tools starting this academic year 2016-2017. Topics of major studies include digital scholarship, use of physical space, and user needs. Faculty and graduate students continue to place priority in providing more library content in electronic form. 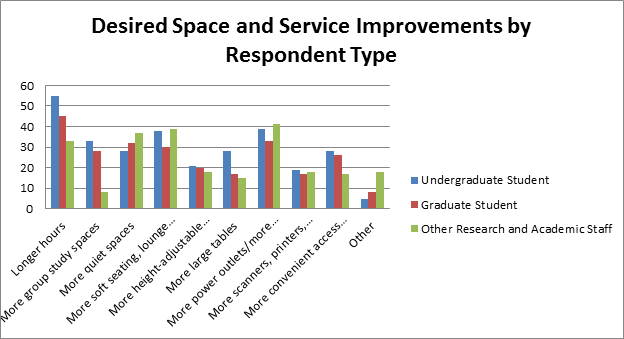 Undergraduates prioritize capturing faster wifi connections, as well as longer library hours. Importance and use of electronic journals to most communities has risen slightly since 2008, the previous library survey, while importance and use of print journals has dropped slightly since that time. While a large percentage of the Mapua community prefers journals and collections of papers in electronic form, a majority of respondents prefer or strongly prefer references and textbooks in print. At least half of all students choose "one of the Mapua Libraries" as one of their preferred study spots. Students who have been in a class where a librarian taught techniques for finding information are significantly more likely to be aware of library resources and services than other students. Although the largest share of starting points for finding books and articles in electronic form comes from Google, TLC and library databases are each one of the top three most likely starting points for these searches. Below are the survey instrument and a variety of tables and graphs with summary results. This question asked about the value of various library services, such as the web pages, the library catalog, new books, and more. These questions asked where the Mapua community prefers to study, and what might improve the Libraries' spaces. The Chief Knowledge Officer, Section Librarians (and OCG) coordinates and oversees library-wide assessment efforts such as the quarterly user/satisfaction survey, manages collection and input of data for accreditation and other centralized reports, and develops and supports assessment efforts in the research and instruction services area of the libraries. The User Experience & Web Services Project is responsible for gathering qualitative and quantitative data to inform the current effectiveness of web services and possible improvements using best practices. It also provides consulting services and collaborates with other departments and teams within the Mapua Libraries, primarily in designing appropriate methodologies for user research related to service and interface improvements. Some staff members are part of the IEC group in the Mapua Libraries. The Libraries are open approximately from 7 am until 6 pm on Saturdays and from 8 am to 5 pm on Sundays (before and during finals week) which means more hours this academic year than in the 3Q January 2015 when the survey took place. In Intramuros Main Library, power outlets have been installed in the readers and circulation areas, and comfortable seating has been expanded. And we’ve designated four collaborative spaces after an extensive renovation. This will add the amount of discussion space currently available in the Libraries for group study. Four group study rooms can be reserved in advance and offer LCD screens with laptop connectors, and glass writing boards.